5:00 AM OPINION: Intolerance exists, and we have to be honest if we want to be better. 5:00 AM OPINION: Sri Lanka is banning social media access in the aftermath of deadly bombings. It's a dangerous path. 5:00 AM "You have to find the threat": US cop says NZ Police's response to Christchurch shootings was impressive. But PM's office says NZ has "not yet seen any intelligence" linking Sri Lanka bombings and Christchurch shootings - as Islamic State claims responsibility. 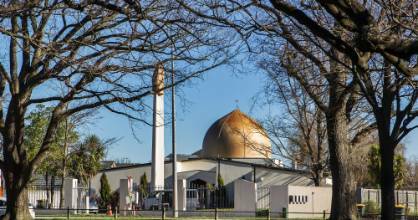 Mosque shooting survivors and family members are being offered permanent residency in NZ. OPINION: Are we brave enough to ask serious questions about racism in our society? OPINION: It is deeply disappointing that our sacred day has been molested with so many events, marches and parades unceremoniously curtailed out of an abundance of caution. Each family affected by the mosque shootings will have one point of contact to help them navigate support services. Futsallers back on court together after eight years to honour slain Kiwi goalkeeper's memory. Christchurch terror attack sparks "unprecedented" levels of online activity from white supremacists. OPINION: I am liable for a $10,000 fine. If I'd distributed the manifesto, I'd be up for a 14-year sentence. Farid Ahmed was singled out by the Prince of Wales for his message of forgiveness after the attacks. System of a Down frontman Serj Tankian is auctioning off one of his paintings to raise funds for terror attack victims. Farid Ahmed lost his wife in the attack, but he did not dwell in anger. Police reveal new details about what was happening behind the scenes on the day of the Christchurch terror attack. Police are helping deliver 300 care packages sent from Auckland for terror attack victims. Students who produced artwork in show of support to Muslim community want to find it a Wellington home. Victim support is ramping up its payments to shooting victims after those injured complained about the slow response. OPINION: The symptoms might be familiar to many Cantabrians: Forgetfulness, an inability to focus, difficulty in completing simple tasks, anxiety, irritability, insomnia. Surgeons performed dozens of surgeries and patients spent thousands of hours in ICU following terror attacks. Criticism of Six60's "love song" lyrics at terror attack benefit concert unwarranted, promoter says. A miscommunication led families of victims from the Christchurch shooting to turn up for a meeting that never happened. Details of the prince's two-day visit to NZ next week have been announced. Armed cops: The new normal? Police believe officers are at risk and should be routinely armed. Academics and others disagree. Stirring performances from the biggest acts in Kiwi music had a deep and poignant purpose. New Zealand's top musical talent gathered in Christchurch for a benefit concert for the March 15 attack victims. Stan Walker, Lorde and Dave Dobbyn wowed viewers with their emotional performances at the Christchurch charity concert. Emotional singer shows her support for Christchurch terror attack victims at the city's beneift concert. NZ's first Muslim childcare centre reopens, while two of its driving forces deal with their own grief. Band's opening song at the Christchurch Aroha Nui concert riles some with its lyrics referencing a loaded gun. Stars performing at Christchurch's You Are Us/Aroha Nui concert are spreading love through their lyrics. Kiwi singer gets emotional dedicating his new song to Christchurch terror victims. Lorde's highly anticipated "special guest appearance" included two songs at the Christchurch You Are Us/Aroha Nui concert. By the time first responders reached the Al Noor mosque, the alleged shooter was only a minute away from his next target. Christchurch terror attack leads InternetNZ to write a policy enabling the suspension of .nz websites. Denouncing racism was the overriding message in this year's race unity speech competition. Opinion: It is not in the New Zealand Government's interest, economically, politically or otherwise, to limit freedom of information to its Kiwi citizens. OPINION: People are best-placed to lead their own recovery and define what will have the most impact for them after a crisis. Many New Zealanders agree with the changes put in place, but some think they don't go far enough. About 2000 illegal guns have been volunteered to police in the past three weeks. The biggest music event of the year, the benefit concert You Are Us - Aroha Nui, will go ahead on Wednesday night in Christchurch. These are difficult times in which to assess where free speech ends and hate speech starts. ANALYSIS: While terrorism may represent the actions by a small number of extremists, they are fuelled by social norms. Wasseim Alsati was taking his daughter Alen for her first visit to the mosque when they were both shot. Death threats – and support – for those accused of possessing or sharing mosque shooting video. This year's University of Canterbury graduates will miss out on parading through the streets after police advised against it following the March 15 terror attack. Social media giant preparing global livestream crackdown on its 2.3 billion users with some to be blocked from live broadcasting videos. Mohammad Shamim Siddiqui survived the deadly Christchurch terror attack but is badly injured. Now he's struggling financially. OPINION: The UN can help New Zealand after the terror attacks, says Kiwi official. OPINION: In times of trouble, we draw comfort from beauty, art and light. New Zealand has become a very different place since the Christchurch terror attacks on March 15. Sold-out show to raise money for terror victims takes Aucklanders on a wild emotional ride. OPINION: The only way to prevent extreme acts of terror is to face our shortcomings. 'I thought Muslim was a country'. How the Christchurch terror attacks changed a homeless man's life - and led him to a new family. Worshipper abused at mosque claims man knew 'exactly what he was doing' when he hurled racist insults. All the action from Auckland's Spark Arena as Dave Dobbyn, Anika Moa, Six60 and more join forces for those affected by the mosque shootings. "I don't find any of this stuff 'funny', but to help audiences step through the absurdities of hypocrisy is funny." A huge banner said: 'Solidarity with the martyrs of Christchurch from Pakistan'. March 15 started as a day of unity and hope. These teenagers are clinging to that. Accused allegedly sent a photo with the words 'you're next'. Shihad's singer found religion, knows all about name changes, and gets political correctness. In a sea of hatred online, the alleged Christchurch gunman did not stand out to authorities. Why not? OPINION: What turns troubled young men into mass killers? We need to know. The accused mosque shooter donated thousands to identitarian movements. This is what we know about them. "You are us" doesn't have to be a slogan Dave Dobbyn says ahead of concerts on Saturday and Wednesday. Where will the prince visit and stay during his royal visit? This time, it's complicated. Auckland University says there's "no evidence" white supremacy is a growing problem on campus. A "second by second" timeline of the police response to the Christchurch mosque attacks will be released next week. A "digital fingerprint" of the mosque attack live-stream will help identify any similar offending on Facebook. A second Christchurch Anzac event has been cancelled in the wake of the Christchurch mosque shootings. Auckland University says it isn't aware of a rise in "offensive propaganda" since the Christchurch attacks. Man says he was distressed to see video of his tirade at mosque, that he can't remember. A man wearing a Trump shirt who allegedly yelled abuse outside a mosque targeted in the Christchurch terror attack has been arrested. ​A young girl who was shot in the Christchurch terror attacks has sustained brain damage and doesn't recognise her parents, her father says. Winfrey says Jacinda Ardern has set the global standard in leadership with her handling of the Christchurch shootings. The All Blacks star is on a mission to preach acceptance in the wake of the Christchurch terror attacks. Ban on all semi-automatic and military-style weapons officially been signed into law. The suspected Christchurch mosque gunman told the officers who arrested him there were nine people involved in the terror attack. Members of the Muslim community are "shocked" after a Scientology Church member offered "therapy" at a Christchurch mosque. OPINION: In her first press conference after the Christchurch shootings, our PM seemed overwhelmed. I remember asking myself if she could handle her duty. NZ's "ugly face" came up with the Christchurch mosque attacks, so Tiki Taane decided to do something about it. The mother and son trying to share some love to those affected by the shootings. A top Facebook director claims the mosque shooting video wasn't graphic enough to trigger its warning system. New guns laws - what's next? New law set to pass by the end of the week, but reforms are not finished with these issues still to debate. Anzac march cancellation a "small sacrifice" given the risks, Queenstown RSA boss says. The hundred-year commemoration of an Indian massacre will take on special significance this year. OPINION: Will New Zealanders stay away from Anzac Day services or turn up in greater numbers? Man wearing a Trump shirt yells abuse at members of the Muslim community gathered at the mosque where more than 40 died. What will change with New Zealand's new gun laws, what won't, and how did it happen? The banning of a range of rifles will become law less than a month after the massacre that prompted the swift change. The Christchurch City Council has cancelled an Anzac Day event in the wake of the Christchurch mosque shootings. The $1.7 million paid out already should be just the start, victims of the Christchurch terror attack say. Get the lowdown on the line-up, transport and road closures for Auckland's You Are Us/Aroha Nui concert. New Zealand's terror threat level has been downgraded, but terror attack is still "feasible". A 16-year-old denies distributing objectionable material from the March 15 Christchurch terror attack. Some counselling providers are taking the brunt of increased demand after the Christchurch terror attack. Almost 25,000 Crusaders fans are calling for the club's name to be kept following the Christchurch terror attack. A psychiatrist at Palmerston North Hospital was inspired to write a list in an attempt to educate people about his religion. A mosque shooting victim is living on less than $40 a week after rent and facing a long work layoff. Floral tributes to terror attack victims may be wilting, but Cantabrians are still showing the love. Indian tourist Maheboob Khokhar was killed in Christchurch's Al Noor mosque two days before he was to fly home.